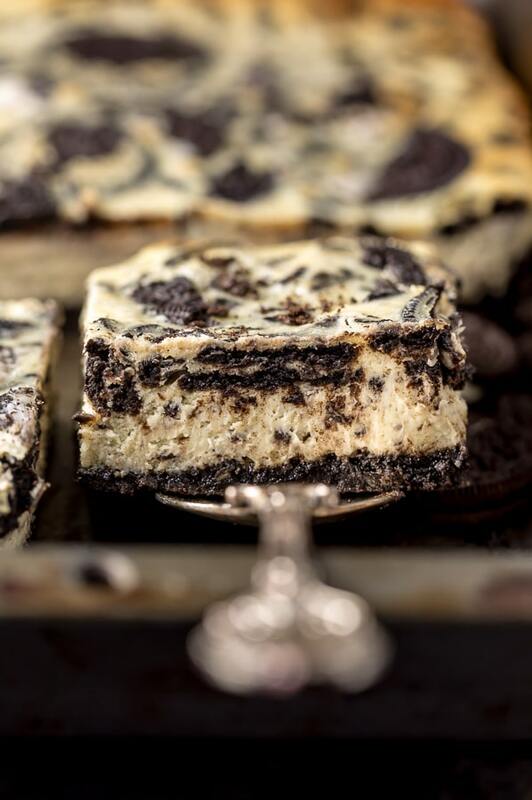 This is the best and easiest recipe for Oreo Cheesecake Bars! Crunchy, creamy, and loaded with Oreo cookies in every bite. Everyone in our family loves Oreo cookies. And while I love dunking one in a glass of milk as much as my future hubby, my real passion is baking with them! No surprise there… right? 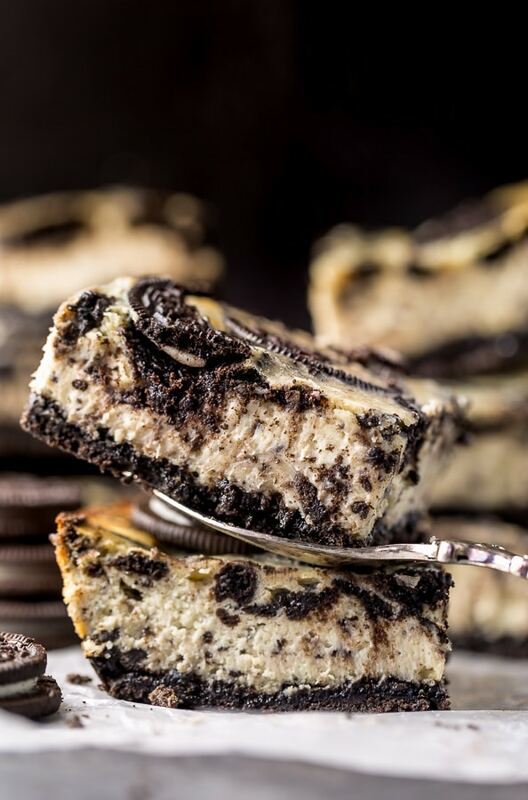 In the past I’ve made you yummy treats like Oreo Cookies and Cream Donuts, No-Bake Chocolate Oreo Pie, Oreo Cheesecake Cookies, and New York-Style Oreo Cheesecake. I love all of those tasty treats, but today’s new recipe might be my all-time favorite! 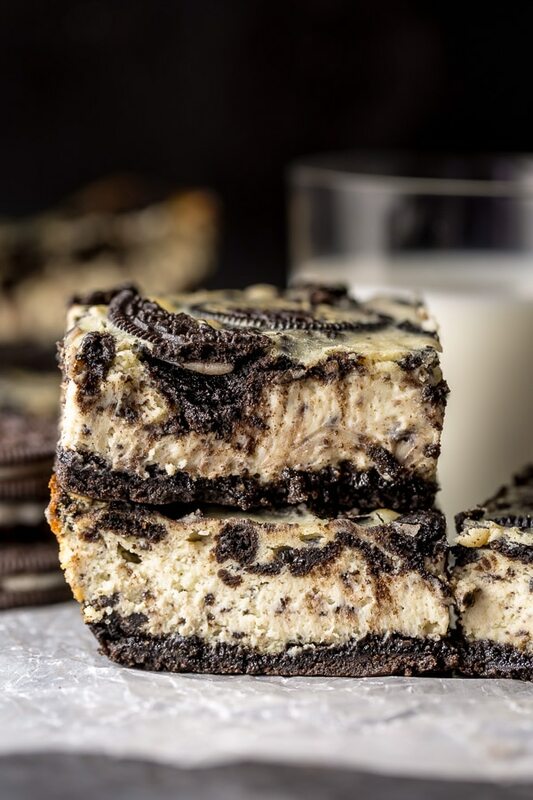 Because these Oreo Cheesecake Bars are rich, creamy, and LOADED with crunchy cookies in every bite! But the best part? 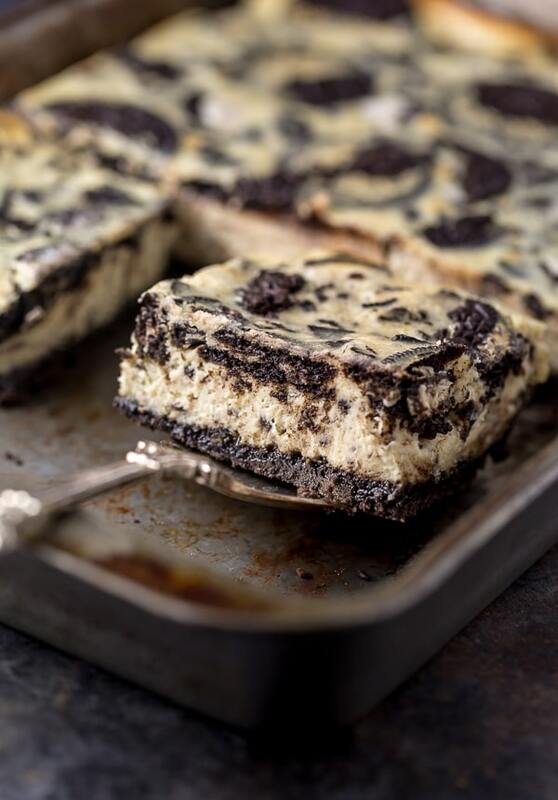 These cookies and cream cheesecake bars are freezer friendly! And let’s be real… in this busy world, who doesn’t love a make-ahead dessert recipe?! This easy cheesecake recipe also does not require a water bath or a springform pan! When pressing the Oreo crust down into the bottom of the pan, you’re going to want to press it down very firmly. A firmly packed crust will bake up nice and thick, and most importantly, won’t crumble too much when sliced. I recommend starting to press the crumbs down in the center of the pan, then working the crust out and just a little bit up the edges. You can use the back of a spoon to do this, or wrap your hand in a piece of plastic wrap (also known as saran wrap) and do it manually. Room temperature ingredients are crucial when it comes to making a cheesecake! So be sure you bring your cream cheese, eggs, sour cream, and heavy cream to room temperature before you begin making the batter. 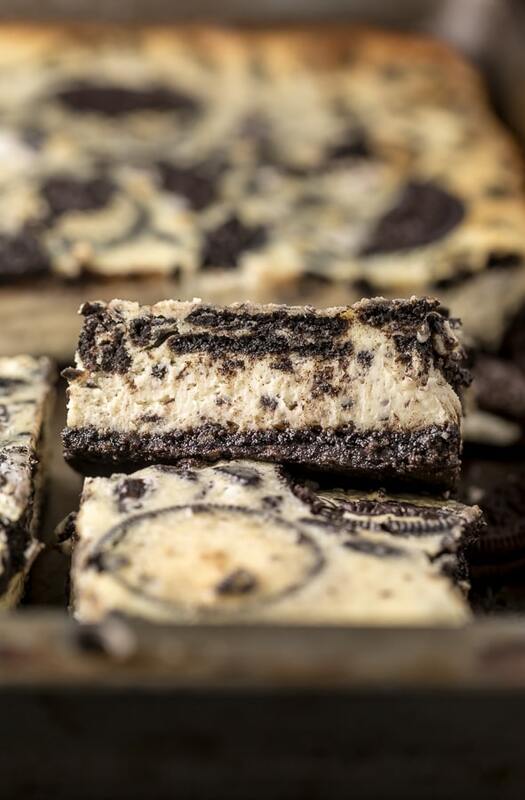 These easy and impressive Oreo Cheesecake Bars can be baked, fully cooled, and frozen for up to two months! Making them a perfect holiday dessert option. Simply thaw the night before you plan on serving! Then slice and serve! You can serve them as is, or top with whipped cream and crushed Oreo cookies. Rich and creamy Oreo Cheesecake Bars! Made in a 9x13 baking pan and no water bath required! In a large bowl combine the crushed cookie crumbs and melted butter, mix well to combine. Press the mixture into the bottom - and slightly up the sides - of the prepared pan. Stir in the flour, mixing just until combined. Using a rubber spatula, fold in the cream, mixing just until it's incorporated in the batter. Finally, fold 3/4 of the chopped Oreo cookies into the batter. Pour filling on top of prepared crust, and spread evenly. Sprinkle the top with remaining Oreo cookies. Check to ensure your oven has cooled to 325°F, then place the pan in the oven and bake for 35 to 40 minutes, or until the edges have set and the middle is still a little jiggly. The cheesecake will firm up a lot as they cool. worth being fat to eat thee! Is there any egg less option for these ?.